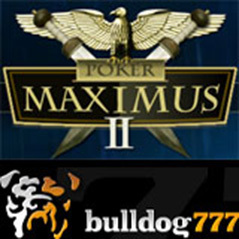 This weekend sees the conclusion of the popular Poker Maximus Tournament Series at Bulldog777.com with two huge tournaments. First up at 8pm UK time on Sunday 16th September is a $55-$5 buy-in No Limit Hold’em tournament with a guaranteed prize pool of $150,000. The big money action continues an hour later at 9pm UK time with $200,000 to be won in a $500+$30 No Limit Hold’em tournament. There is still time to win your way to the Main Events through daily satellites, as well as buying in directly. A complete tournament schedule is available at here. New players can also receive up to $750 in bonus cash when they use coupon code “B777150” to make their first deposit. One of the most popular poker rooms on the Merge Poker Network, Bulldog777.com offers customer service in Russian and English. Its Badbeat Jackpot is currently about $390,000. Even after the finale of this series, it will continue to offer a full schedule of weekly GTD and freeroll poker tournaments.